Comes with plastic parachute kit. The balsa fins are pre-cut. Self-adhesive decals are cut from the included decal sheet. This Korean sounding rocket was used to gather data on ozone concentration over the Korean peninsula. The KSR-420S also carried a highly-specialized device to measure micro gravity. In somewhat less peaceful times, the KSR-420S could be modified to carry a 200kg destructive payload over a considerable distance. 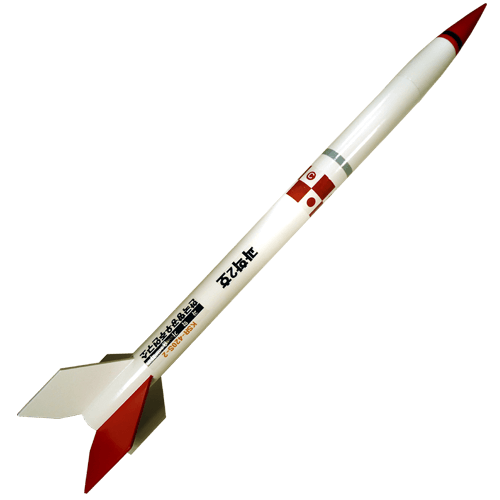 This sport-scale model of the KSR-420S flies on a cluster of three 18mm model rocket motors. The KSR-420S is easy to build. This makes it a great choice for rocketeers new to clustering.